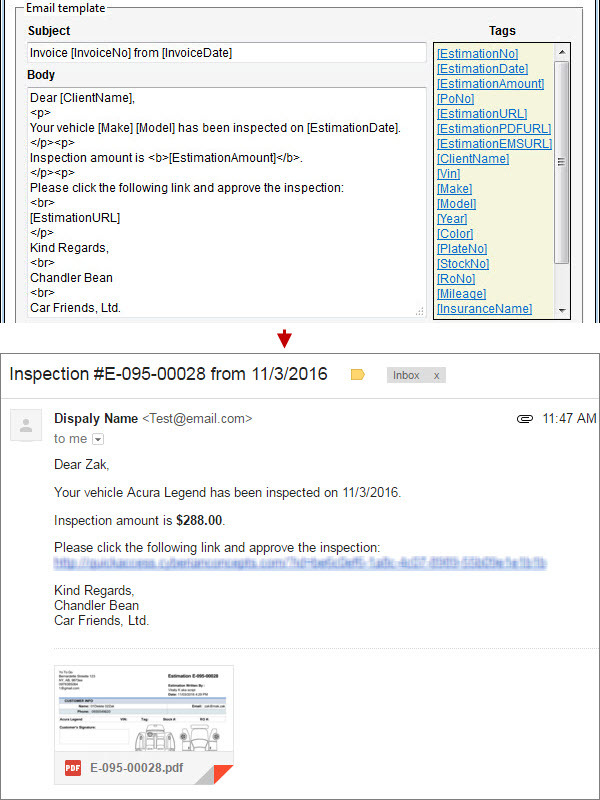 You can use email templates for sending inspections, work orders, and invoices by email or fax in messages with a typical subject and body. You can set up different email templates for wholesale and retail clients, as well as for different types of inspections, work orders, and invoices. You can create email templates if you log in to the Back Office application with Administrator user account. On the Company tab, click Email Templates, and then on the Email Templates page, click Add on the toolbar. Name lets you distinguish between email templates when you set default email templates or assign email templates to inspection types, work order types, and invoice types. Type defines whether email template is used for inspections, work orders, or invoices. Also email template type defines the list of available tags. By default the Invoice type is selected, so invoice tags are shown in the Tags box. If you select another type, the appropriate tags will be shown. 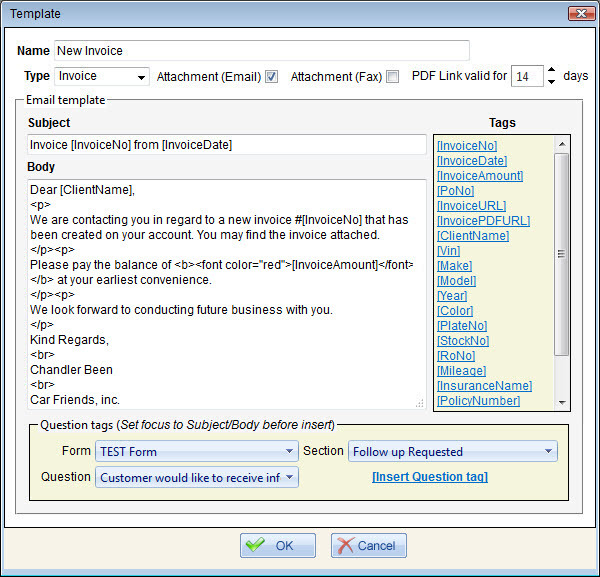 Attachment (Email) defines whether inspection, work order, or invoice printout must be attached to email. Attachment (Fax) defines whether inspection, work order, or invoice printout must be attached to fax. Learn how to turn on sending inspections, work orders, and invoices by fax. PDF Link valid for X days specifies the period within which the link to PDF file is valid. Subject specifies the email subject which can include text and tags. Body specifies the email body which can include text and tags. The Body setting supports basic HTML formatting, so you can add the following HTML tags to make emails easier to read and highlight certain information. <br> inserts a single line break. <hr> inserts a horizontal break line. <p>sample text</p> defines a paragraph. <b>sample text</b> defines bold text. <i>sample text</i> defines italic text. <u>sample text</u> defines underlined text. <font color="red">sample text</font> defines text color, such as "red", "blue", "green", etc. <font size="4">sample text</font> defines text size, such as "1", "2", "3", etc. <a href="url">link text</a> inserts a link. Tip: You can use uniform resource indetifier schemes in <a href> tag, for example, mailto: allows sending an email to a specific address without first having to copy it and enter it into an email client, callto:, tel:, skype: allow inititing calls to a specified phone number via the appropriate application. <img src="url"> inserts an image. Tip: If you want to insert your company logo, you can right-click your company logo on the website, and then click "Copy image address" to get the link for <img scr> tag. Tags includes labels of the fields available for selected type. To insert a tag into email template, set the cursor in the appropriate place in the Subject box or the Body box, and then click the appropriate tag. Question Tags lets add question tags to the Subject box and the Body box of the email template. 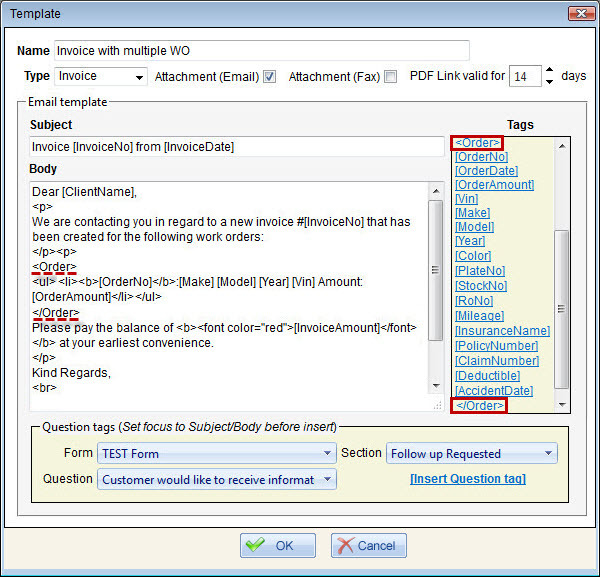 To insert a question tag into email template, select the appropriate question form, question section, and question, set the cursor in the appropriate place in the Subject box or the Body box, and then click the Insert Question Tag link. Note When you select the InvoiceBatchEmail type, the Separate attachment per invoice (up to 10) check box appears so that you can define whether batch invoices should be attached as separate PDF files. 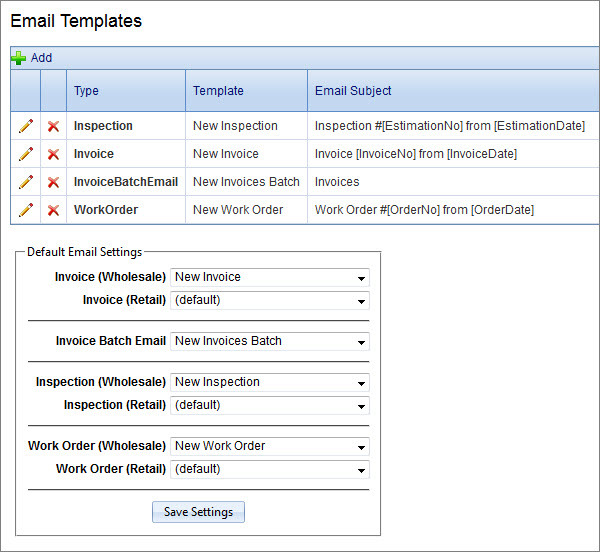 The Invoice Batch Email type lets create email templates for sending multiple invoices in one message. 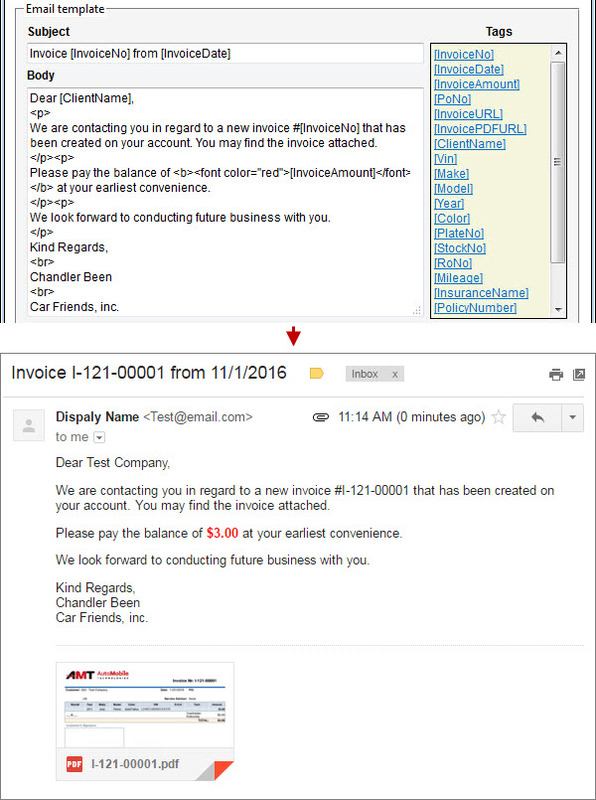 You can specify clients which invoices can be sent in a message generated from a particular email template of the Invoice Batch Email type. 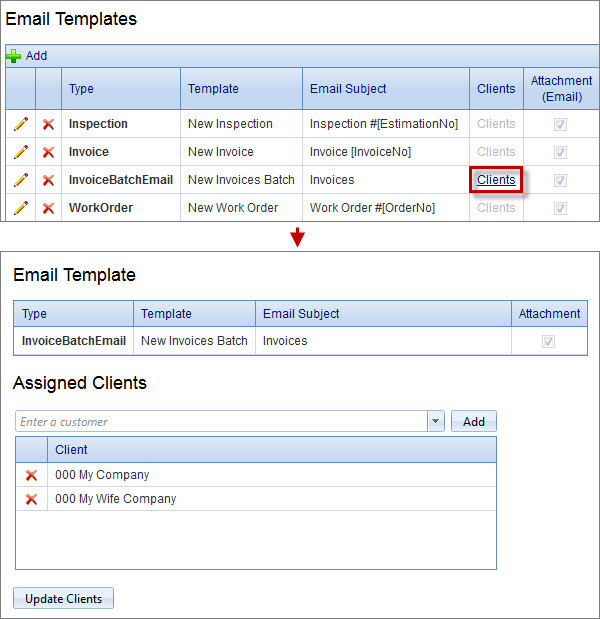 On the Email Templates page, in the Clients column, click the Clients link next to the appropriate email template with the Invoice Batch Email type. On the Assigned Clients page, click the client that you want to assign, click Add, and then click Update Clients. 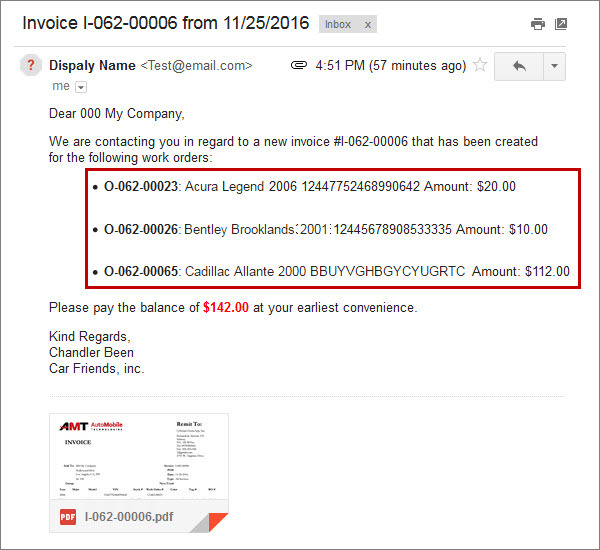 Tip You can use tags <Order> and </Order> to set up email templates for invoices with multiple work orders. 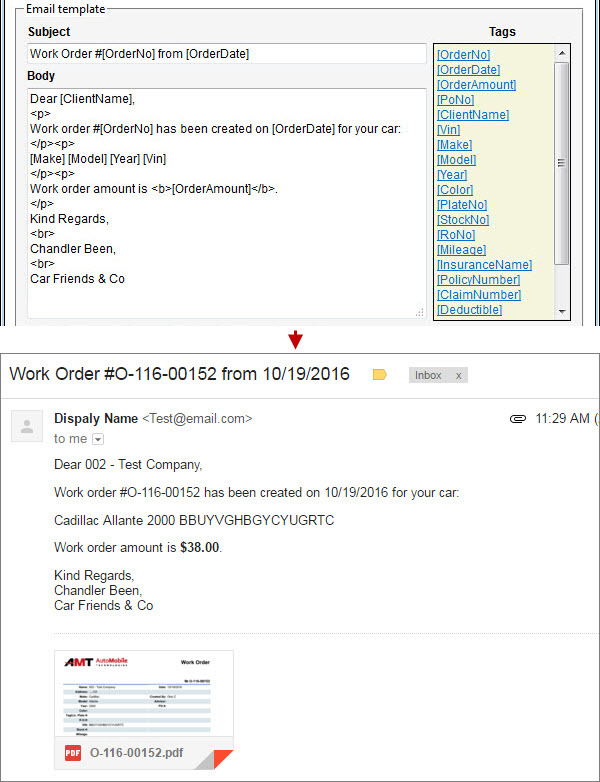 For example, if an invoice contains three work orders, their details, such as work order number, work order amount, vehicle model, make, year, and VIN can be listed in the email body. In the Template dialog box, in the Body box, insert the <Order> tag, enter text and insert tags that represent order details (such as [OrderNo], [VIN], [Make], [Model], etc. ), and then insert the </Order> tag. Note The [InvoiceNumber] tag shows the list of invoice numbers. 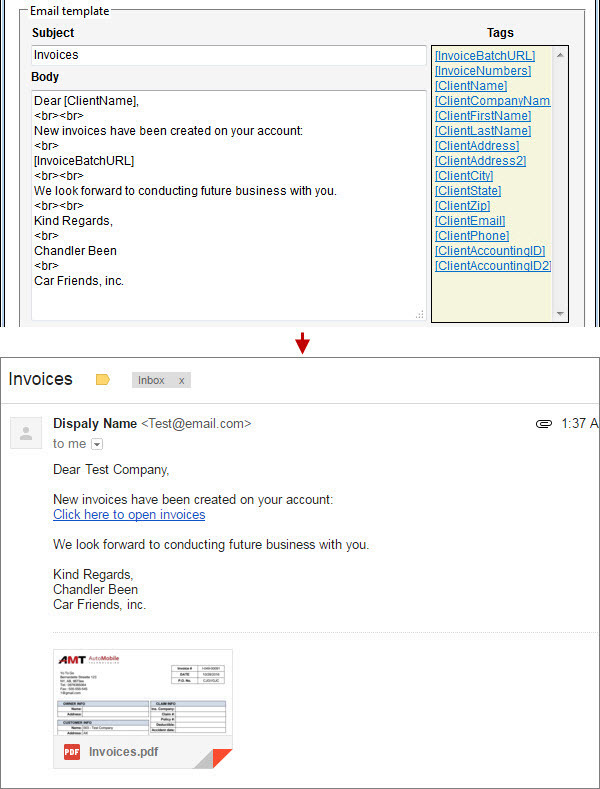 When you send an inspection, a work order, or an invoice (multiple invoices) by email or fax, default email templates are used to generate the message. Note You can set different default email templates for wholesale and retail clients (except for the Invoice Batch Email type). On the Email Templates page, in the Default Email Settings section, select the appropriate template for the appropriate types, and then click Save Settings. 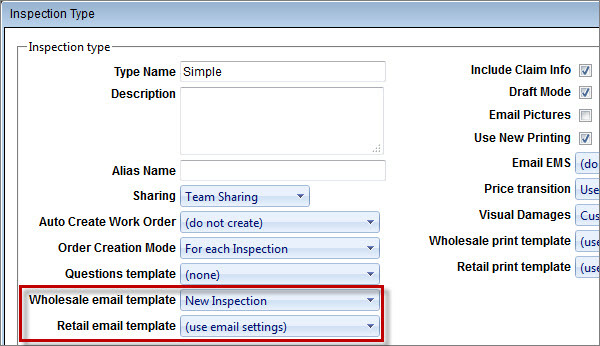 You can assign email templates to particular inspection types, work order types, and invoice types, so that when an inspection, work order, or invoice of these types is sent by email, the assigned email template can be used to generate the message (instead of the default email template). On the Company tab, click Inspection Types (or Work Order Types, or Invoice Types), and then click Edit next to the appropriate inspection (or work order, or invoice). In the Inspection Type (or Work Order Type, or Invoice Type) dialog box, click the appropriate email template in the Wholesale Email Template box and/or in the Retail Email Template, and then click OK.